Can I Feed My Cat Tuna? Is Tuna Safe For Cats? “Can I feed my cat tuna?” You probably ask this question if you want to share a bite of sushi or a tuna fish sandwich with your cat, or maybe you ran out of cat food and are wondering if a can of tuna is a safe substitute. Humans eat tuna from a can, cooked tuna, or sometimes even raw tuna, so is it safe for cats to eat? The answer to that question is yes, most cats can safely eat some tuna, but only in moderation and only under certain conditions. In some circumstances, tuna can be very harmful to cats. You should always ask your veterinarian before sharing any human foods with your cats, including tuna. 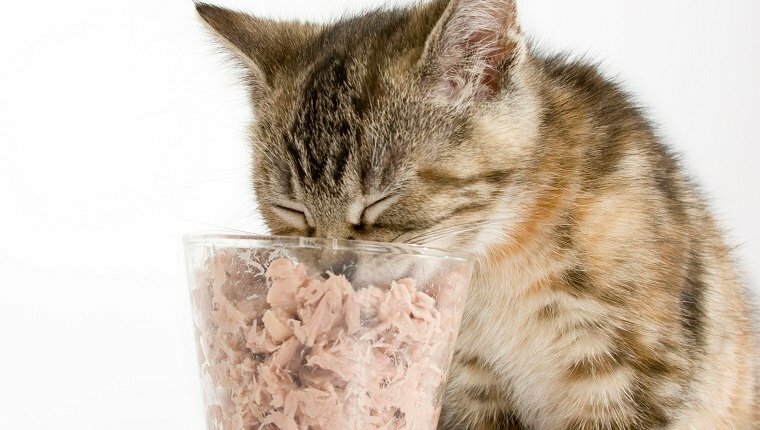 Here is what you should know about feeding tuna to cats. 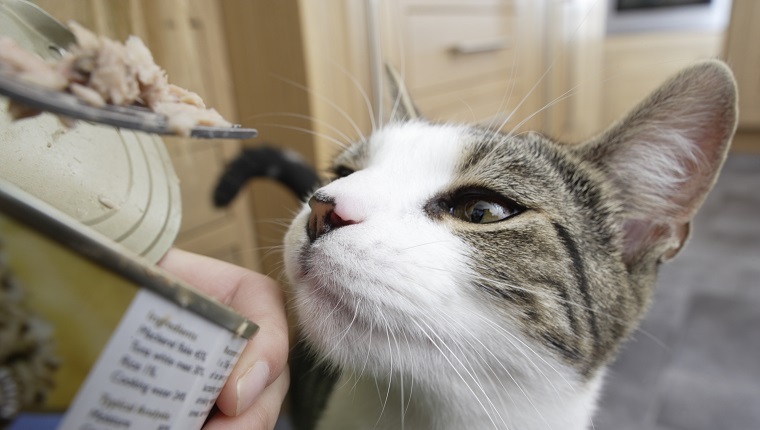 When Is Tuna Safe For Cats? Tuna is generally safe for cats if it is eaten only in moderation, and it should not replace your cat’s normal, balanced meal. While tuna will provide your cat with good servings of protein and omega 3, it will not provide other necessary vitamins and nutrients that they need. Eating tuna too often can lead to serious health issues in cats. The safest option for tuna to give your cat is 100 percent real tuna, as some types of tuna contain artificial fish flavors that are not healthy for cats and may be linked to hyperthyroidism. Check the label and make sure there are no additives or chemicals. If you plan to feed your cat tuna from a can, make sure it is tuna in water, not in oil. You can use the tuna water on your cat’s normal food to get their appetite going if they are a picky eater, but you should gradually wean them off of it. Talk to your vet if you want to give that a try. For tuna that is fresh from the counter, make sure it is boneless and unseasoned. Seasoning can contain garlic, spices, and other additives that are toxic or unhealthy for cats to consume. Also, be aware that cooked bones can shatter or splinter and damage your cat’s gastrointestinal tract or cause choking. Cook the tuna thoroughly before serving. If you want your cat to be on a raw diet, you must discuss this with your vet and learn the proper ways to prepare raw food that reduce the risks of bacteria or parasites for you and your cat. How Is Tuna Bad For Cats? There are many reasons that tuna should not be fed to your cat on a regular basis. Tuna is a deep water fish that is not part of a cat’s regular diet. It cannot meat all of their daily nutritional requirements. That’s why it is best to use as a sometimes treat or mixed in with a regular meal on occasion. Here are a few circumstances where tuna may be harmful to cats. Tuna addiction. The smell and taste of tuna can be so attractive to some cats that they become addicted and refuse to eat any other food. Overfeeding tuna. Tuna can’t provide cats with all the vitamins and nutrients they need to survive. They may suffer from vitamin E deficiency, for example, which can cause yellow fat disease–a condition that causes inflammation and tissue damage under the skin. Mercury poisoning. Tuna does contain small amounts of mercury. In large doses or in small doses given over a long period of time, it can poison cats. Allergies. Some cats are, in fact, allergic to tuna. If your vet says it’s okay for you to give your cat tuna, start with a very small amount and check for swelling, coughing, sneezing, itching, and other signs of an allergic reaction. If your cat is allergic to tuna, do not give it to them again. How Should I Feed Tuna To My Cat? You must first consult your veterinarian before you feed your cat tuna. They can give you appropriate serving sizes, advice for preparing the tuna, and let you know how often you can give tuna to your individual cat. If your vet says you can try giving your cat tuna, give them a very small amount at first and see how they react. If they have symptoms of an allergic reaction or get sick, stop giving your cat tuna. Tuna should be only a sometimes treat for your cat, and it’s best to mix it in with your cat’s regular food. A full can of tuna is far too much for a single serving. One teaspoon of tuna a few times a week should be enough. It should not make up a significant portion of their diet. You can serve your cat tuna from a can or fresh tuna. If it is from the can, as mentioned earlier, make sure it is real tuna in water with no additives or chemicals. 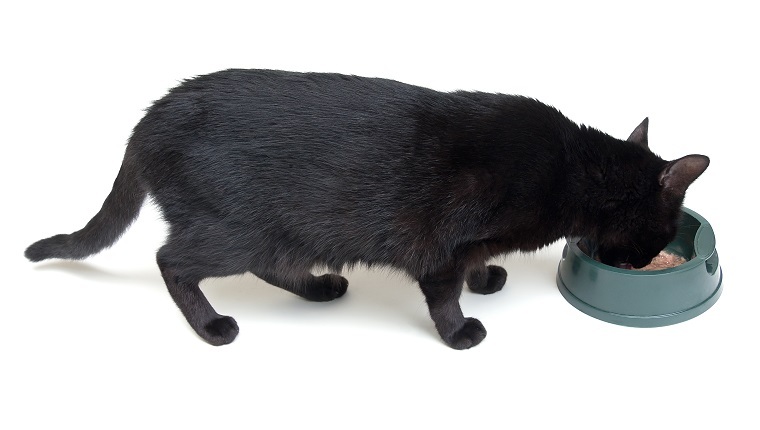 You can use the water on your cat’s regular food to encourage them to eat, though this should not be done for a long period of time, and you’ll need to wean your cat off of it eventually. If you want to serve your cat fresh tuna, make sure it is boneless and has no added spices or ingredients that may be harmful to your cat. Does your cat ever get tuna as a treat? 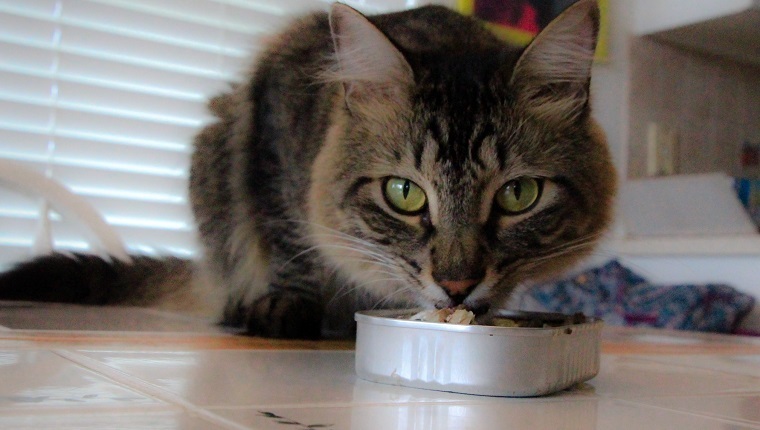 What other kinds of food does your cat like to eat? Let us know in the comments below!